The Gay Gamer: DS Crystal Chronicles: Lookin' good! I really don't know what's gotten into the head honchos at Square-Enix in Japan. Sure, they created masterpieces on the SNES/Super Famicom as well as the PSOne, but to be honest I've been far from impressed with what they've turned out since. If the company's recent and upcoming releases on the DS are any indication, though, the creators of Final Fantasy are back where they belong: making great, genre-busting games for hard-core players. Lately most of my Squeenix attention has been focused on Heroes of Mana and Final Fantasy XII: Revenant Wings. 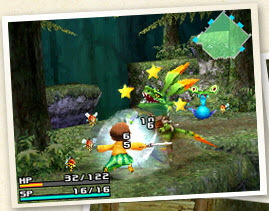 That's slowly changing, though, as more screenshots and information are released about another highly coveted DS offering: FF Crystal Chronicles: Ring of Fates. Those looking for a few tasty looking shots of the upcoming action-RPG should check out a recent post on Gamefront.de. Frankly, I amazed the DS will be pumping out such detailed 3D environments on the fly, and I can't wait to find out more about the characters, settings and how the darn thing plays (oh, and when it'll be released, too).